My fellow Overwatchers. We’ve been waiting with bated breath for the release of the next hero. Everyone was excited with the hype surrounding a famous entertainer combined with hints littered throughout the in-game meta. Then we were taken by surprise when we first heard a story about an 11-year-old genius. Who was this young girl? Weren’t we supposed to have the infamous Doomfist? Well, Blizzard finally revealed that next hero in the line-up; and instead of Doomfist, it’s a brand new addition to Overwatch lore. Orisa is a robot designed by Efi Oladele, a child prodigy who wanted to build something that would protect Numbani. Using older model robots, she created a brand new hero, albeit one that is as naïve as its creator. What’s most beautiful about this new hero, is its celebration of diversity – on so many levels. Overwatch has been lauded for its varied cast, celebrating gender, race, culture, and sexual orientation. 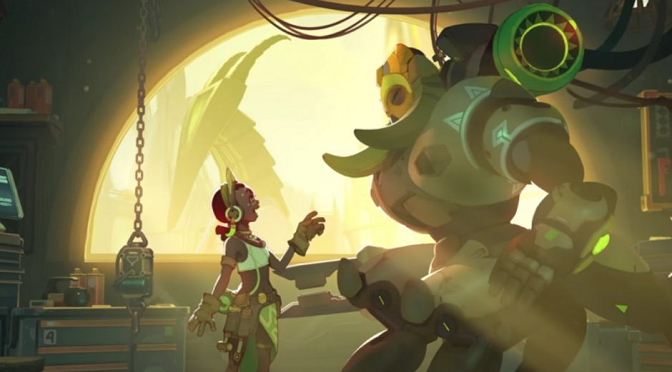 Orisa – and through proximity young Efi – continues to add new aspects to the game’s lore and representation. Even better, we’re introduced to this character just as we end Black History Month and begin celebrating Women’s History Month. Probably the greatest, and most notable, aspect is the Afrocentric design and story. A young African created Orisa, living in an African utopia, and made in the image of African art and legend. Even the name itself derives from African religion, tapping into oft-neglected ideas and cultures. Adding onto this is the celebration of women, in both the creator and the robot itself. Efi Oladele proves that a person should not be constrained by gender or age when it comes to ability or field. Also, she gives her creation a female voice (with an African accent at that), bringing a powerful avatar onto the field of battle. There is no doubt that this celebration of African culture, women, and youth was done on purpose. Blizzard’s writers and designers seem to be following the trend seen in comics and movies, unabashedly bringing representation to the masses. While there are criticisms where their approaches fail to be completely inclusive, we cannot deny how Overwatch sets a new bar. Even if I’m disappointed at the lack of Terry Crews, I cannot wait for this new character to hit the main servers. I salute Blizzard for their continued efforts at representation in gaming and hope that Efi and Orisa become a new fan favorite.